Mercy Health, an integral part of the Tiffin community since 1913 and one of the largest employers in Seneca County, announced today a merger with Bon Secours Health System, creating one of the largest health systems in the country. MARRIOTTSVILLE, Md. and CINCINNATI, Feb. 21, 2018 /PRNewswire/ — Bon Secours Health System, a Catholic health ministry serving residents across the East Coast, and Mercy Health, a Catholic health ministry serving Ohio and Kentucky, today announced their intent to merge, creating one of the largest health systems in the country spanning seven states in the eastern half of the U.S. Together, Mercy Health and Bon Secours rank in the top performing quartile of Catholic health systems for low-cost, high-quality patient care, promoting healthier lives and creating more affordable health care for residents across an expanded footprint. The merger creates the fifth largest Catholic health system in the country, allowing the new entity to leverage economies of scale by integrating resources and teams across the ministries. This merger creates future opportunity to deepen our commitment to our existing communities and expand the health ministry into complementary service areas across United States. Further alignment of the ministries offers an opportunity within the United States and outside of its borders to bring healing and hope to those most in need. One of the top 20 health systems in the nation and the fifth largest Catholic health system with $8 billion in Net Operating Revenue and $293 million in operating income. This strong operating margin allows us to advance our shared ministry and reinvest in community benefit. The Ohio Bureau of Workers’ Compensation has announced a new program designed to provide health and wellness resources and services to employees of small businesses (50 or fewer employees) in high-risk industries. Better You, Better Ohio! aims to help both employers and their employees through this free, paperless program. Workers can earn financial rewards for participating in wellness assessments and screenings, and will be provided with opportunities to pursue a healthy lifestyle. This in turn benefits employers by encouraging a healthier workforce, increasing productivity and lowering workers’ compensation claims and insurance costs. More details about the program and enrollment can be found here. Meet Mark Somodi, the CEO and Administrator of PT Services Rehabilitation, Inc., a healthcare provider offering physical therapy, occupational therapy, speech-language pathology, and athletic training services. Their headquarters and administrative office is located on the south end of Tiffin at 2550 S. SR 100, and this year they are celebrating 45 years in business. PT Services has been incorporated since 1972, with its humble beginnings right here in Tiffin! Today, the Ohio-based company has 308 employees and manages seven out-patient clinics, six hospital contracts, 25 school district contracts and two nursing home contracts while also providing workplace therapy across the state of Ohio. In 2011, PT became an employee stock ownership plan (ESOP) company, turning ownership over to their employees. Somodi has been with the company for 22 years and is continually improving the business through employee education and engagement. His management includes the “Somodi Principles” which are collaboration, cohesiveness, communication, education and trust. The Mercy Tiffin Hospital campus is growing with the addition of a new facility. On September 11, 2014, the Volunteers of America (VOA) invited the public to the official groundbreaking event for the new Tiffin Rehabilitation Center and Sojourn at Seneca. 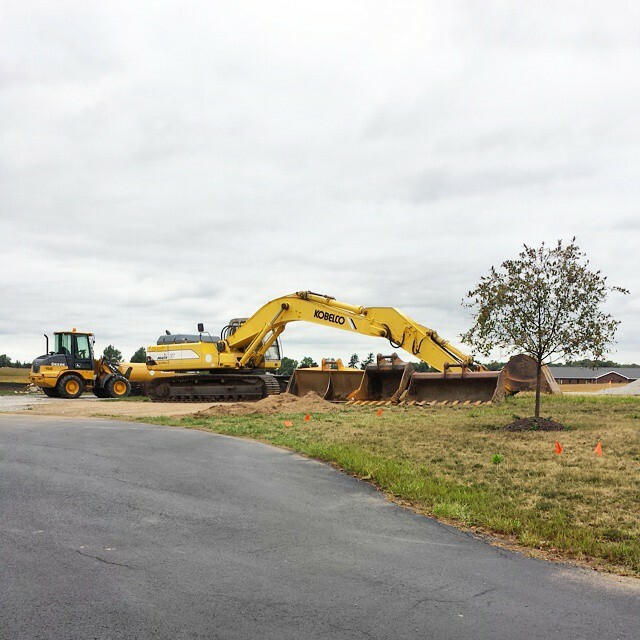 The groundbreaking event was held at 5:00 pm at Mercy Tiffin Hospital, located at 45 St. Lawrence Drive in Tiffin, Ohio. The groundbreaking featured several speakers, including hospital administrators, Mayor Aaron Montz, Mercy Tiffin President & CEO Lynn Detterman, VOA national President Mike King and other people associated with the project. Following the groundbreaking event, a reception was held on the first floor of the McMullen Conference Center. The $9 million project is being funded by the Volunteers of America, who operates Autumnwood Care Center in Tiffin. The facility, set to open in the fall of 2015, is expected to employ 55 and will have two separate wings. In one wing, the structure is to house 20 transitional skilled nursing beds. In the other wing, 24 beds are to be available for seniors in need of short-term mental health services. The project estimates at around $22 million. The facility is to be operated by Sally St. Clair, the current Executive Director of the Volunteers of America Autumnwood Care Center, who will administer both Tiffin facilities. > View Advertiser-Tribune article here.